The THERM200 is a soil temperature probe, which has a temperature span from -40°C to 85°C. It outputs a voltage linearly proportional to the temperature, so no complex equations are required, to calculate the temperature from voltage. It is highly accurate with 0.125°C of resolution. The sensor has a simple 3 wire interface: ground, power, and output, and is powered from 3.6V to 20VDC, and outputs a voltage 0 to 3V. Where 0 represents -40°C and 3V represents 85°. The probes can be buried, or inserted into pots. Since the blade is so narrow, it can easily be inserted into potted plants. The temperature sensor can be used with our soil moisture sensors, and together they can be used to detect the presence of ice. The THERM200 is compatible with our data Loggers, or any other third-party data logger. 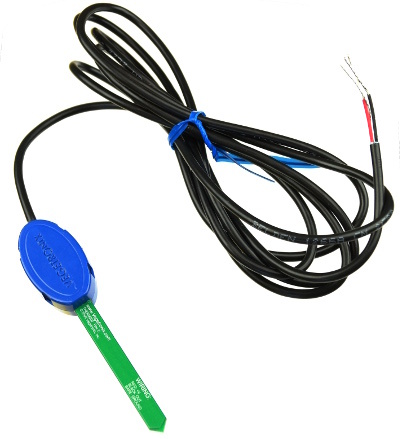 Thermistor based temperature sensors, are typically inaccurate, and use the complex Steinhart-Hart equation which contains complex calculations such as logarithmic and third order terms, which are difficult for microcontrollers to compute. Once you've tried the THERM200, you'll never want to use a thermistor based sensor again. Temperature monitoring of bulk foods. Rugged design for ong term use. Consumes less than 3mA for very low power operation. Output Voltage is linear to temperature. No complex Steinhart-Hart equations are needed to convert voltage to temperature. Can be buried and is water proof. Probe is long and slender for wider use, including smaller potted plants. We ship to nearly EVERY COUNTRY on the planet, directly to you from our factory. 99% of orders ship same day. Contact us for volume pricing information. Supply Voltage 3.6V to 20 VDC. Red POWER: 3.6V to 20 VDC. 1. Where is the temperature sensing element on the probe? The temperature sensor is inside of the blue enclosure. 2. Do I need to bury the probe to measure soil temperature, or can I just insert the blade? You need to bury the probe to measure soil temperature, otherwise, if you merely insert the blade, you will be measuring air temperature, not the soil temperature. 3. Can the sensor read rapid fluctuations in temperature? No. The probe is intended for measuring soil temperature, and typically ground soil does not change temperature rapidly. Likewise the temperature sensor has a high thermal mass because of its waterproof enclosure, and so it make take 15 minutes or more to settle after a rapid external temperature change. This does not mean that you need to power the sensor for 15 minutes before taking a reading. It means that it takes some time for the center of the probe to reach the same temperature as the soil in which it has placed. The best way to get started is to order a few sample soil temperature sensor probes and try them out in your application. Please use our online ordering system to purchase units.